“The shoes must always be polished front and back…or people will know what sort of person you are.” This mantra of concealment, complete with quotation-marks, is one of the inner watchwords of a main character in Marguerite Van Cook’s graphic memoir The Late Child, a thought that we see exposed in classic comic-balloon but which reveals nothing of the woman’s own identity, a forgotten handbook maxim laid over whatever she might really be thinking. Words are well-chosen and imperative in Van Cook’s reminiscence, but not paramount; this is comics, a visual medium in which to show is the way to tell, and the schism between the story people carry and the picture they feel compelled to paint is central to this phenomenal achievement of personal exploration and empathetic biography. The woman keeping her eyes cast to her feet is Van Cook’s mother Hetty, called before a tribunal in post-WWII Britain to judge whether she is fit to keep and raise her daughter, born out of wedlock. Hetty is a survivor of the blitz, the grand atrocities and private tragedies and strangely vibrant togetherness of which Van Cook’s text describes in its terrifying and surreally everyday detail, while portraying the tenacious exterior and personal trauma of its witnesses — “It was a duty to keep oneself up,” the psychological narration says in one scene where Hetty is resetting her hair as she walks through a firebombed neighborhood; “Just because everything was a mess, there was no reason she should look a fright.” After making an intimidating show of their authority, the panel does let Hetty keep Marguerite; surface is all-important, but the grown-up Marguerite’s purpose is to reclaim the interior. We see her young self walking past and playing in bombsites that stay piled where they fell decades after the war; excavation is no small task. And we walk in many shoes that her remarkable emotional insight inhabits. A harrowing encounter with a would-be child molester is told half from his perspective, a marvel of empathy which also emphasizes the detachment from such a memory, and even identification with the predator, that survivors of such ordeals can experience. Van Cook, who painted over the astonishing ink drawings of artist James Romberger throughout, believes that much comic coloring forms a wall of solidity that cancels out the illusionism of drawing and pushes the reader out of the narrative; her skill in shifting the perspective of the book’s narrators — from her mom to herself to criminals and magistrates and even occasional birds and beasts who are in the landscape of semi-civilized humanity — keeps the reader viewing the story from a vantage point within it, and her coloring keeps all surfaces active and transparent, superbly defined in their spatial relationships and psychological keys, but expressive of the ephemerality of true sight and lived sensation. Romberger’s style is a wonder of optical and dramatic economy, reminiscent of illustration in the leading modes of the mid-20th-century period the book portrays — loose and sketchy to convey the forward velocity and succinct sophistication of the West’s self-image, charming in its simplicity and assured in its catalogue of abbreviated emotions, encyclopedic in its observation of the abundant urban and country environments while ambitious in its formal experimentation and interpretive shadings. This book is an intimate epic of what was missed in one’s own family and personal memory, and Romberger has a sharp instinct for what to leave out — on a trip to the countryside, young Marguerite is shown walking into a monumentally framed rural scene on a trail that tracks into it from an otherwise empty column of white with some type; this sudden sensory overflow is mirror-imaged in some moments of the confrontation with the sexual predator, in which color and life abruptly drain out entirely; Romberger’s decisive black line allows Van Cook to play these keys perfectly. Collaborators in art and partners in life, Van Cook and Romberger are conscious of where words can intrude rather than explain; the book orchestrates brilliant moments of the comic form’s components colliding, as when an intonation from a jurist overlays and utterly obscures Hetty’s face. Like the lurching historical span it takes place in, the book leaps forward between several stories of Hetty’s youth and Marguerite’s. Evolving from showing to telling, from English wartime hesitance to the self-revelation of a revolutionary era, Van Cook & Romberger depict, early on, a lovely painting that Hetty’s first husband had made of their garden (sent to her in lieu of censored battlefield correspondence); much later, we are not looking at but in the middle of such a feast of natural bounty, as Van Cook describes an endless continental meal on a teenage vacation to stay with friends in France. This is conjured in the lapidary language Van Cook’s poetic sense practices throughout, though as it draws on and on, it seems to morph into a satire of Proustian particularity. Young Marguerite and a girlfriend end up walking off the excessive feast and collapsing in a country church, hilariously heedless of any salvation, and return to the gathering joyously, but the undertow of much less happy concerns is never absent — not only in a parallel storyline of abandoned innocence that I won’t give away here, but also in the simple fact, as hard for us to remember at first as it may have been for Marguerite to notice, that she is only having all this fun with someone else’s family, in someone else’s world. The undertow metaphor is not random; we see oceanic imagery from the start of the book onward, in the coastal town the characters originally inhabit, to the beaches Marguerite loves in both Britain and France, to a scene of lyrical horror when Hetty is waiting in the legal office and imagines the room filling up with water; Van Cook supplies the image of social suffocation, and Romberger portrays it with surf crashing against this strong, scared woman, an island of integrity and uncertain fortune, like the forgotten wartime legend of the nation that is now failing her. Van Cook is a master of writing in displaced time, inhabiting the limited perspective of a moment in her life with utter vivid conviction while observing its meaning with the insight of contemporary context. Witnessing but not quite comprehending the student riots of France in 1968 and judging them unromantic, “we were the first to understand the profundity and meaning of pure love,” she writes of her and her teenage French best friend with the obliviousness of youthful discovery; not much later, in rejecting the manicured, arm’s-length world of the friend’s upscale parents, she says “we launched our senses out of childhood and demanded the right to touch,” a poet’s perspective on corners being turned that one doesn’t see the direction of at the time. 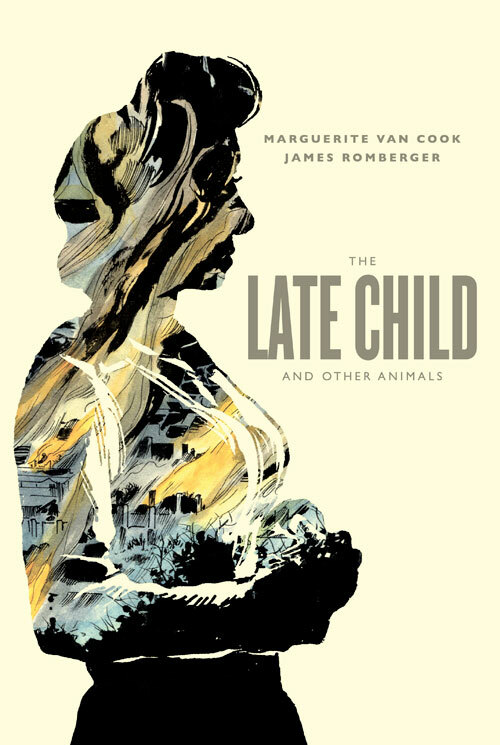 Van Cook’s most meaningful rebellions, as musical provocateur and artworld pioneer and literary prophet and patron of individuality (and Romberger’s blazing of paths in populist media and his artistic and scholarly role as a voice of political justice and cultural dignity) would come years after that, and The Late Child is a testament of the valued lives and essential insights that have a right to the years it will take for their time to come. This entry was posted in graphique concrète, Lower East End, stranger nonfiction on December 7, 2014 by adammcgovern46.